Along with the Lounge Chair and Ottoman in leather, this may be one of the most well recognized pieces in modern design. Low-slung, with an expertly crafted molded plywood seat and back, this chair is extremely comfortable and built for longevity. This chair is considered a breakthrough in modern design. The piece was designed using technology for molding plywood that the designer developed prior to, and during, The Second World War. Previous to the American involvement in the war the architect entered a line of furniture into the Museum of Modern Art’s “Organic Furniture Competition” in 1940. The competition was set up to explore the natural evolution of furniture in response to the rapidly changing world. This entry was chosen as the winner of the competition. However, production of the initially designed chairs was postponed due to production difficulties, and then by the United States entry into WWII. This interruption proved fortuitous to the designer. He began making molded plywood splints for the U.S. Air Force. The splints were modeled after his own leg and allowed him to hone the technique of molding the plywood into complex curves. The plywood series was a result of this experience. Initially the makers set out to find a solution to providing affordable, comfortable furniture that could be easily mass produced. Thew architects entries into the Organic Furniture competition were designed to have the seat and backrest joined in a singe ‘shell’. The result was a comfortable chair with a sleek and modern appearance. The seat was joined to the lumbar support and legs with a series of four heavy rubber washers with nuts embedded in them (later these came to be called ‘shock mounts’). The shock mounts were glued to the underside of the seat, and screwed in through the bottom of the chair. The backrest was also attached using shock mounts. The rubber mounts were pliable, allowing the backrest to flex when the chair is occupied. This was one of the first examples of a chair with a responsive backrest. Even though the plywood chair was a compromise it still constituted a successful design. Following the LCW the desinger created a family of plywood chairs. The all-plywood Dining Chair Wood (DCW) was constructed in the same manner as the LCW, but with a narrower seat, and longer legs. The Lounge Chair Metal (LCM) and Dining Chair Metal (DCM)were constructed of the same plywood seats and backrests as the LCW & DCW set on a welded metal frame. DWR sells the DCM for $379. Gibraltar Furniture offers the same unlicensed reproduction for only $239. Molded plywood dining chair, and metal legs. Your choice of White Oak, Ebony or Walnut! All of these products are inspired by the Charles and Ray Eames. 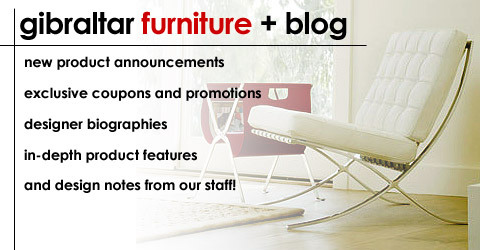 Gibraltar Furniture is not a Herman Miller dealer. These products are not associated, connected, manufactured, sponsored, or affiliated with Herman Miller or the Eames estate. In addition Charles Eames has not originated, sponsored, or approved any of our Eames style products. This is not a Herman Miller Eames product but has the exact look, feel, and design of the original release.